The Golden State Warriors needed a big lift from their bench to down the Cleveland Cavaliers 104-89 in the NBA Finals opener in Oakland on Thursday. With Warriors sharpshooters Stephen Curry and Klay Thompson going cold, Shaun Livingston, Andre Iguodala and Leandro Barbosa came through to spearhead a decisive 15-0 run at end of the third and beginning of the fourth quarter. "I missed some shots and didn't get a rhythm, but the way that they defended, we'll be able to find some adjustments for Game Two. Not worried about that," said Curry, who settled for 11 points, two more than his backcourt team mate, Thompson. "Just really proud of the way everybody contributed. You don't win championships without the entire squad coming in and making an impact on games." In a rematch of last year's championship series, won by the Warriors in six games, LeBron James and the Cavaliers had taken the lead for the first time since the opening minute with a surge midway through the third quarter. Livingston, who scored a playoff career-high 20 points, Iguodala (12) and Barbosa (11) picked up the slack for the defending champions, however, with the Warriors bench outscoring their Cleveland counterparts 45-10. 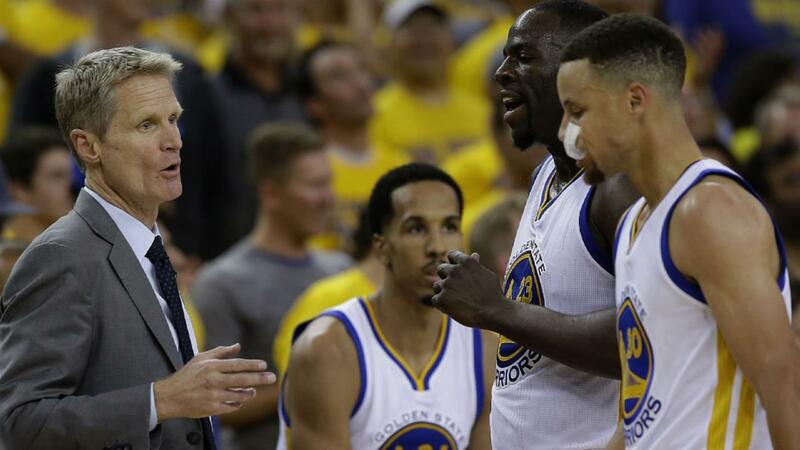 "This was a strange game for us," Warriors coach Steve Kerr said. "We're not use to having both Steph and Klay off like that with their shooting. "But we've said all year that if we defend and take care of the ball we're going to have somebody score enough points, whether it's the starters or the bench. "I thought we played great defense. We had nine turnovers total and that allowed us to control the game, and our bench obviously gave us a huge lift." Livingston has played for nine different teams in his 14-year career but has found a home with the Warriors in the last two seasons. "Steph and Klay, they're our guys," said the 30-year-old, whose team have now won four straight games since falling behind 3-1 to the Oklahoma City Thunder in the Western Conference final series. "I think the series with [Oklahoma City] really prepared us for this series. "It can be anybody on any given night. We just have to stay ready." As well as a standout performance on offense, Iguodala helped limit James to 23 points and made the most of his knack of stripping opponents of the ball when in close. "He's great at doing that, for sure," James said. "Just got to do a better job protecting the ball. It's that simple." Game Two is in Oakland on Sunday.